Finding a great tasting veggie burger can be a difficult endeavor. Many of recipes fail to bind properly or burn on the stove due to a lack of fat. Store-bought veggie burgers tend to be dry or lacking in flavor. With that in mind I was pleased to see a new veggie burger recipe to try in the March issue of Better Homes and Gardens. All ingredients in this recipe are easily found at any grocery or supermarket. The prep is very easy and takes far less than the 25 minutes stated in the recipe (it took me about 10). Even the tomato-basil sauce was a snap to make in my food processor. I used a stainless steel pan but would use a non-stick next time to more evenly brown the burgers. The recipe uses a nice blend of pre-made and fresh ingredients, making it an easy and quick vegetarian weekday option. My family liked this recipe. The burgers were quick and, unlike many recipes, did a nice job of binding together before being added to the pan. My husband thinks adding mozzarella slices to the recipe would be a nice addition. I would use this recipe again as a quick way to get a vegetarian meal on my family table. 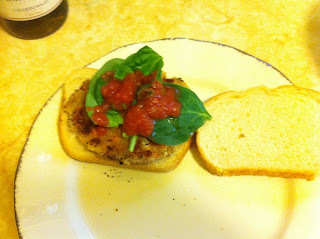 The recipe can be found at Better Homes and Gardens Veggie Burgers. That looks so yummy. Popping by and following you from the blog hop. Have an awesome day! And when you get a chance come on by and check out my blog. I know what you mean about finding a good veggie burger recipe....thanks for sharing this one with us! Found you from the Monday blog hop--I'm the latest follower-this looks delish! Hello! Stopping by and following from the Deals and Dishes Link Up Lounge. I've added your button to My Button Collection page. Stop by, look around and say "hi". So yummy! id love to try those! Join me tomorrow for "Deal Seeking Tuesday" a hop where we share our deals and tips! Thanks for the follow during the Miso Glamorous Monday blog hop.